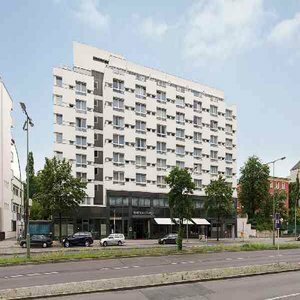 NH Berlin City West hotel is ideally located 5 minutes from one of Berlin's most popular shopping streets, KurfÃÂ¼rstendamm. Offers 136 rooms, including spacious apartments and an extravagant luxury suite. Get the day started at a delicious breakfast buffet. Hotel guests relax on the comfortable garden patio while enjoying the service from the bar. Multi-purpose meeting rooms for business events for up to 60 people. Garage is available for guests travelling by car and bikes are for rent outside the front door. Bundesallee location close to subway stations Berlinerstrasse and Gntzelstrasse, which travel quickly to the rest of Berlin. Practical for Tegel and Schnefeld airports and Bahnhof Zoo.Along Berliner Strasse, there's a fine bakery, caf, large supermarket and the wonderful Badenscher Hof jazz club and restaurant. Walk to KuDamm Street daily (15 minutes). Internet cafe a few doors down towards the metro station.